to it and today is the day. An hour or so in, though, you get tripped up by the wording in step 8. You read it three times, but still don’t understand what you’re supposed to do. “This must be wrong,” you think. If you’ve followed a few patterns over the years I’m sure this scenario sounds familiar to you. Sometimes patterns are wrong. Pattern instructions often have many, many steps and within each step are dozens of details. It’s very easy for designers to unknowingly make an error. It’s never intentional, but it’s always possible. And most PDF patterns are self-published which means there’s no editor to catch mistakes. Sewing patterns, like recipes, benefit from being tested. One of the many wonderful things about being a part of an online sewing community is the ease with which designers can now find people who are willing to test patterns for them, and the ease with which we can get feedback and incorporate changes. Still setting up and managing the pattern testing process can be daunting. Sara Lawson, modeling one of her bag designs that will be in her new book, Big-City Bags, now available for pre-order. 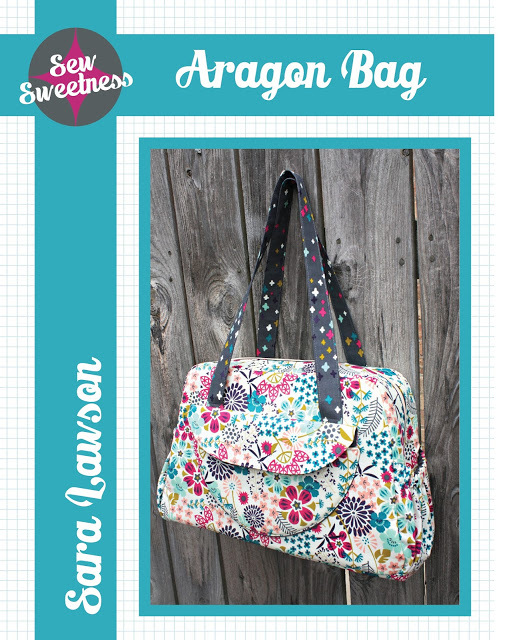 Sara Lawson is the designer behind Sew Sweetness, a line of sewing patterns for bags. Sara creates patterns for totes, purses, lunchboxes, and wallets. I’m always impressed when she launches a new pattern on her blog not only because her bags are beautiful, but because she invariably shows us 20 versions sewn by 20 different testers! If you can recall what it was like getting edits on a school paper and having to revise, you know that incorporating just one person’s edits is a lot of work, but 20 is truly incredible. How does she do it? A big thank you to Sara for sharing with me, and with you, how she goes about recruiting and managing her pattern testers and incorporating their feedback, and why she decided to use so many. mass e-mail out to my group, with information about the pattern and due dates. 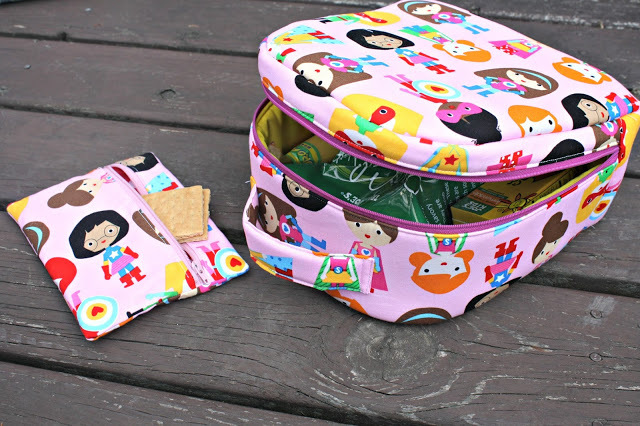 Peas and Corn Lunchbox, a Sew Sweetness pattern. In her launch post for this pattern you can see all of the pattern tester’s lunchboxes. Testing a sewing pattern requires thinking carefully about how patterns are made and how they can be improved. It sounds like Cindy really benefits from testing Sara’s patterns. Okay, back to Sara now. A sampling of Sara’s bags. Find all of her patterns in her shop right here. What If They Don’t Finish? Take a look at Sara’s post about her newest bag pattern, the Aragon Bag, and scroll down to see all of the different versions her testers made. What effect does it have on you as a potential customer to see all of these versions made up? 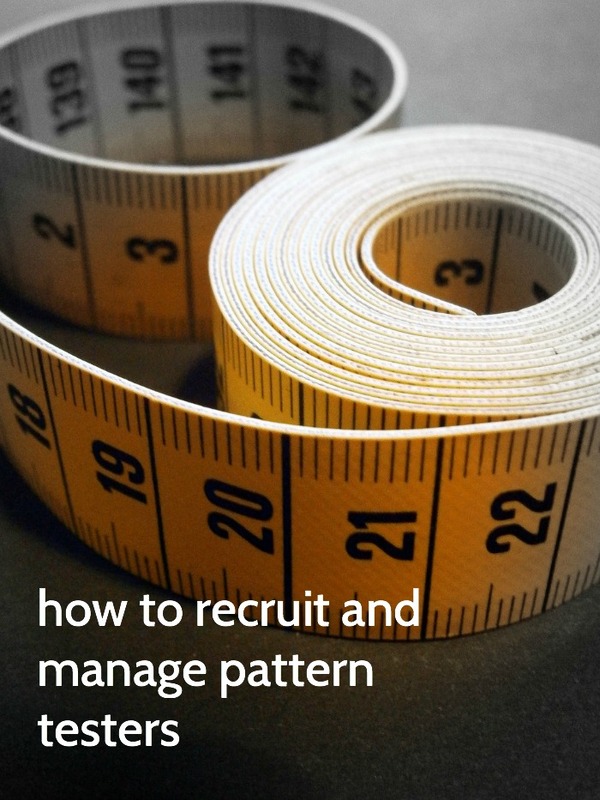 If you’re a designer, how do you recruit and manage your pattern testers? And if you’re a sewist, how would you approach testing a pattern? And please feel free to ask Sara follow-up questions, too! Thanks, Abby. I really admire Sara for all of the testing she does and the women that test for her. She must really be organized because that is a lot to manage! It never occurred to me to ask for pattern testers via blog post. I make sure each of my patterns are tested by several sewers…but not 20! I definitely need to broaden my pool. And to your point about not having an editor because of being self published, I hire a copy editor that goes through all of my copy in the directions, glossary, cover, materials list, etc. The copy editor doesn’t make the bag, but she is familiar with sewing and is an expert on the english language, grammar, formatting, etc. I think it really helps make my patterns concise and easy to follow. I’d love to compile a resource page of both freelance copy editors and freelance tech editors for sewing pattern designers. Because you produce print patterns, Betz (as does Sara), it’s especially important that the final draft be perfect, but even as a PDF pattern designer I’d be interested in hiring an extra set of professional eyes. Hi Abby, I’m trying to ascertain as to whether you have a compiled list of pattern testers that I could add my name to? I’m really eager to gain the experience through everything from softies to clothing and bags. Any advice or knowledge is welcome! Thank so much! Hi Kate, I don’t have a list of pattern testers. I know that Sara of Sew Sweetness does so you might want to send her an email. I also know that many designers ask in their Facebook groups for testers so it might be worth joining the groups of your favorite designers. I have tested two patterns, and I loved it. It was fun to help a designer I like bring a new pattern to publication. I got to try something new, and I got a free pattern, too! I look forward to doing it again. The first time I tested a pattern we had a stomach bug go through our house (yuck!) so it was a little tough to get it done in time. But I had two weeks to complete it, and I sew pretty much constantly, so it was doable. As a customer, I love seeing the different versions of the bags; it helps me envision a pattern in different fabrics/versions. Well done article Abby! Thank you for the opportunity to share my views. I also agree with what Emily above said, that seeing so many variations in the design and fabric choice REALLY helps in selling a pattern. In store bought, you may have only one view to look at. In this method, you have many. A really important factor for me. I don’t have time to volunteer for testing many patterns, but I was wondering recently when sewing a pattern from a book with confusing instructions how I could become a freelance tech editor for patterns. The other thing that’s great about seeing a designer have lots of testers is there’s a built-in group of pattern reviewers that you know have sewn the pattern. I sewed a children’s dress pattern recently that looked cute in the pictures, but I didn’t like many of the techniques used to sew the dress. I wondered if anyone else had given the designer feedback on the techniques she used. I think there is a niche here for someone like you to create a small business as a freelance tech editor! With more and more designers self-publishing, you could really do well. I hope to see this develop! As far as giving designers unsolicited feedback on their patterns, it’s tricky. I think some will welcome that, and some might not. I’d like to think I’m open to new ideas and methods. That’s a great point, Cindy, and one of the reasons that sewing is seeing such a revival now. Indie pattern designers can provide so much more context and help, and they can show lots of views and options. It’s really wonderful! Plus you can email them! Thanks for this, Emily. It does sound like it would be fun to be a part of bringing a particular pattern to completion. Sara has given me the chance to test some of her patterns, and I just can say THANKS to her, I’ve learn new tecniques, I love sewing bags and this is a great chance for me. So interesting that you post this right now! I myself just organized my first pattern testing. I launched the finalized pattern last week. I thought it was great to see all the wonderful versions my testers came up with. The majority of my testers was great. They really helped improve the sewing instructions. Unfortunately there were a few who never replied again after having received the (free) pattern as well as some who’s feedback was merely a “thank you, I really enjoyed sewing for you. the pattern is great” or who’s photos were not good enough for me to be able to post them on my blog or use them as examples in the pattern-PDF itself. It was a small number of people, but I’m still asking myself whether there is anything I can do to avoid getting these “false” testers and those who simply don’t contribute to improving the instructions. I find that if you have a pool large enough you’ll eventually weed out the ones who never follow through. Sure, it’s great to be flexible, I’m all about giving people another chance, but if time and again the tester is letting you down, I think it’s ok to drop them from your list. I’ve found that over time I have testers who stick with me, as long as I make it clear how valued they are to me, and remember to show them I appreciate them, they’re happy to put up with a whole page full of mistakes (true story!). I prefer the testers who are very blunt and tell me the things that need telling, regardless of my feelings! If you’re still in need of testers give me a shout and I’ll forward your email address to my most trusted testers to reply to you. Thanks for this great interview, Abby and Sara! I’ve self-published a couple of patterns, and I love the idea of hiring a professional tech editor mentioned in some of the comments above. I also wanted to note that, for designers of quilt patterns, there is also a great resource available in the Quilt Pattern Testers Yahoo group (http://groups.yahoo.com/neo/groups/QuiltPatternTesters/info). That’s where I’ve gone to find testers for my patterns, and I’ve always gotten a good response. Thank you so much, Samantha! At the moment I’m only doing my blog and my sewing instructions in German…but I’ve got an English page and patterns/instructions planned for next year. So I would love to get back to you when I do need testers for my english patterns! Interesting range of blog posts recently Abby. I agree that it is a bonus as a potential pattern purchaser to see the bag made up in so many fabrics and variations. It can help you picture the item in a fabric that may be more your taste and see how others have customised it, which can change the character of the item and widen its appeal. This is a huge advantage for indies who can add as many pictures as they want to their blog, over a printed pattern with one view on the cover. for a more complex or intermediate pattern I think it makes you more confident you can do it yourself and to a reasonable standard if all the pattern tester versions look that good. This would also encourage me to buy. This is really helpful for newbies like me. I love the idea of showing off the finished products to show range of pattern uses. And so smart to send the doc also so testers can make notes. 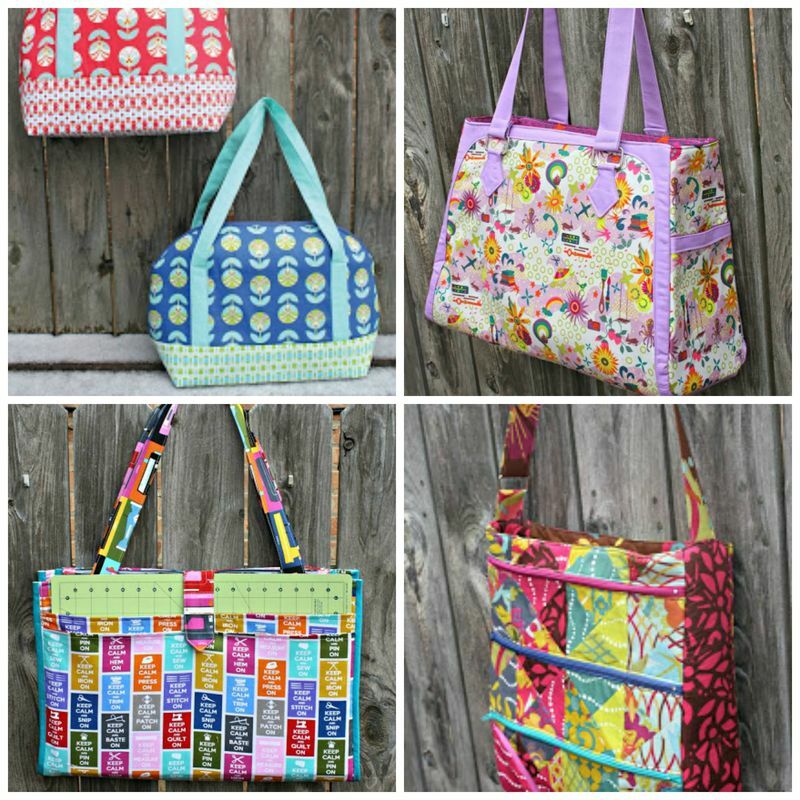 I have tested several of Sara’s bags as well, and I love being a pattern tester! In fact, Sara’s patterns are so well written – even in the testing stage, that I cringe every time I have to use other patterns that are not so well written. I always look forward to her pattern release days to see what everyone else has made. This is such a terrific resource, Casey! Thank you for sharing it! I wonder if there is something similar for testing patterns for things other than quilts? If not, there’s an opportunity for someone! Exactly! I have an idea for a post brewing about why indie pattern designers are leading the way in bringing on a sewing revival. That’s wonderful praise for Sara, indeed! I think it’s comforting for potential customers to see that lots of regular home sewists have successfully made the pattern. If they can do it, I can, too! I look forward to stopping by and reading your blog posts because I always walk away learning something. I only sew as a hobby and have been one of those folks who has purchased a pattern then had a hard time following the instructions because they were poorly written. It made me feel like I had wasted both my time and money. I think it is a great idea to show examples of a pattern made by different people because it would definitely sway me to purchase that pattern over one that didn’t have examples. I have a few cookbooks that I’ve cooked two or three recipes from and every single time there was something wrong with the recipe. So frustrating! I end up giving those books away. I think even if designers don’t recruit as many testers as Sara does, having a Facebook page where you can show off customer work can serve the same purpose. It’s inspiring to see what other people are sewing from the patterns. Hi Abby, I use 6 testers for each pattern at minimum and I love to use new people. Have some great people who offer to pattern test a lot but after a while, they begin to speak Jodie so new testers are very important. I Think testers need to be highly valued , they are invaluable and generous sharing people, and I wish I could afford to pay them. I send the pattern and a kit of fabrics to make the pattern ( this also checks that the requirements are correct as I send the amounts as they appear on the pattern sleeve). Pattern testers, from that point on, join my Senior Management Team ( just a silly joke really)but they are free to ask for any of my patterns at any time for free. i have used a lot of pattern testers over my 40 or so patterns and I have found wonderful friends through this rather odd way. I think Sara would agree that she’s made some wonderful friends through the pattern testing process. I think that’s awesome. I like your idea of sending along a kit of fabrics to make the pattern. If testers are limited to just those, they’ll quickly find out if it’s enough or too much to make the pattern. Giving your best testers access to any of your patterns for free is a super nice way to help compensate them for their time and efforts! I read this post a couple of weeks ago and it gave me the boot up the pants to finally get some pattern testers organised. Like Sara, I did it via a blog post but used a form through Google Docs/Drive to collect the info. I now have an Excel spreadsheet of around 100 amazing volunteers, and just sent out my first pattern tonight. I will be choosing 10-20 testers for each pattern depending on the difficulty level. Like Sara, I’d rather be well-tested by a range of sewists and also to be able to share a range of products at the end of testing. Thanks for this post!! I’m so glad to hear that, Alyce, and I know Sara is, too! 100 volunteers is a great base to work from! Best of luck to you! I would like to volunteer to be a pattern tester. How do I go about it? I love sewing. Although I am working full time, I still make some spare time to sew bags and other stuff. It would be great if I can work on some new projects to help me improve my sewing skills. You might want to reach out to Sara directly. Her website is sewsweetness.com. She can add you to her list of testers.